Orange County, NY - Striking back at a verbal tongue lashing by the Satmar Rebbe earlier in the week, Senator elect James Skoufis had some scathing words of his own, warning Kiryas Joel residents to expect no favors during his time in Albany. Just over two hours later, Skoufis fired back at Rabbi Teitelbaum on Facebook. “I guess he’s still rankled that my campaign was able to easily overcome his bloc vote this past election,” wrote Skoufis, describing the remarks as “abhorrent,” “disgraceful” and “dangerous,” wondering aloud if Rabbi Teitelbaum was hoping to “elicit violence” among his followers. News 12 Hudson Valley (http://bit.ly/2AKvcMi) reported that Skoufis has continued to speak out publicly about the Satmar Rebbe’s remarks. Reactions to Skoufis’s statements on Facebook have been far from politically correct, and full of vile anti-semitic undertones. “Can’t believe we have to share the same space as these vile parasitic lunatics,” commented Facebook user Pete Hermann. 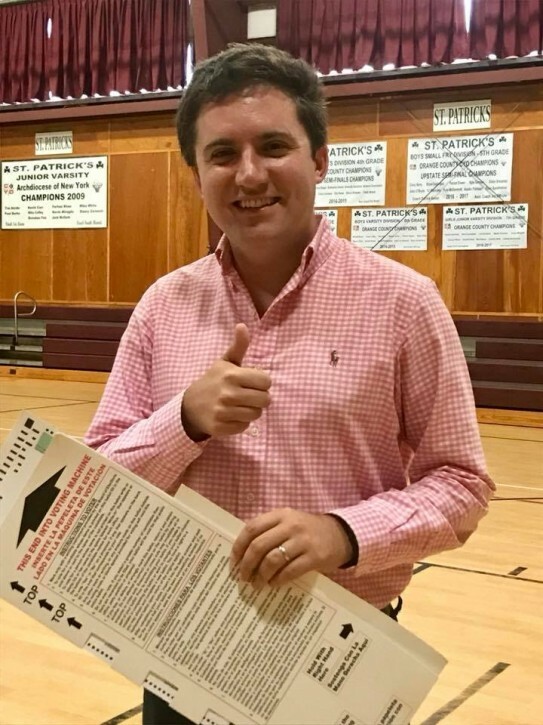 Earlier this month, Skoufis pulled no punches, telling supporters in his Election Day victory speech that he was indebted only to them, and blasting both Governor Cuomo and the Kiryas Joel bloc vote, as previously reported on VIN News (http://bit.ly/2AHwHL6). There will eventually be a showdown; stay tuned. This reminds me of the movie "High Noon" with Gary Cooper. The extremist wing of the Settler movement. Does it matter who started, usually even after a bitter campaign the winning candidate says that he was elected and it's time to unify and he will govern for everybody. This low life said that he owes only for those who voted for him and will fight with everybody who didn't vote for him. The Rebbe's speech in Yiddish should have stayed in Yiddish. Rabbi Aron was foolish in castigating this lowlife in such a public forum. Anti semitism is seriously on the rise and actions of the rebbe just fuels the fire. Another stupid move by satmar. Just because [people call out KJ for what it is, doesn't make them an Anti-Semite. No group of people should be able to form a country within a country. America has been pretty good to us for a long time. Don't take advantage. And also don't follow everything the Rebbi says. Just because a Rebbi's father or grandfather was a great man, doesn't mean he is too. Hashem in charge. Not the Rebba. Has it ever occurred to anyone that everyone can access this site? Enough has been said on both sides to reveal the chasm between them. It might be best to allow wiser and more seasoned individuals to bridge this gap before more are pulled into an abyss that grows more perilous. This will end up in court, and Satmar will win, because of the principle of separation of church and state. Satmar lawyers will take the position that their clients have the right to practice their religion, and the rules of the education department breach this principle. U wishthe Rebbe is in charge. He has hundreds or rather thousands if dissidents. He has his loyal people too but its not like it was. Nobody runs for him cuz his father was Rebbe. Thats over. Generally speaking, theyre still a nice community with the basically no crime and people are decent. U can find faults all over. This antisemite of a guy is horrible. Thats not the way. Hes elected by most of the people but hasta serve all the people. His rhetoric is unusual and very offensive. "Orange County,NY. Hudson Valley, Kiryas Yoel" This is a local issue over housing, water rights etc. Nothing to do with antisemitism, just like the Arab/Israeli conflict is about land nothing else. The fact that Satmer in the USA is fighting with White Christian neighbours and getting along with all the muslims in brooklyn proofs thar israel/arab are a land issue not a muslim issue. Satmar is openly anti Israel, Skoufis is just trying to defend Israels respect. I have heard much worse name calling right here against Satmar than this Skoufis did. Does that mean that all the posters against satmar on many different issues from Israeli Occupation etc are ANTI-SEMITES? Let me understand this, Satmer is anti Israel anti zionist. I have read it here 1000 times Anti Israel = Anti Semmitism. So this guy is a Friend of Israel by attacking Israels enemy. Uh oh. Some people forgot we're still in golus. Where is the ferkrumte uneducated today.This doesnt fit into his White Christian German loving, Muslim hating Shiteh? He must not like the facts that the Satmerers and other frumme live next door to Muslims in Brooklyn for 60 years without a problem untill they try to move to Upstate, Toms River and other White Christian Neiborhooods. I cant recall a single Muslim neigborhood from Flatbush to Detroit where the Muslims complained about Yiden moving in. So who are the REAL Antesimites? The Satmerer rebbe's tirade against public school education is base racism and everyone knows it. Instead of fighting to correct the many problems in their own schools, as discussed 1000 times on VIN, Teitlebaum takes the low road and attacks a public system he can't possibly fathom or understand. Skoufis is an empty suit (I've met him) but the rebbe needs to fix his own shtetl first. Actually, Satmar's win, if it happens, will exist on paper, and have no counterpart in the bank. If the court rules that the state cannot pass regulations on parochial schools because of church-state issues, it will also result that funding for them is also outside of the range of support. No one stops them from practicing their religion, but it becomes improper to ask the state to fund it. Some victory. What have you been drinking? The Arab Israeli conflict is not about land, and never was. It is simple, core hatred of Jews. They don't just want land. They say that to appeal to the mercy of other countries. In reality, the track record of Arab/Muslim terror is shockingly inclusive of non-Israeli Jews and locations outside of the Middle East. One might think that giving them land should pacify them. But these savages take whatever they get, and they turn it into launching pads for rockets, military training, and stockpiling of weapons. And those who support terror fund that, and replenish their supplies when they waste them on Israel, etc. It'snot about land at all. Defend Israel's respect? This has nothing to with Israel politics. Murderers, child abusers, rapists are wicked and evil not a politician that has different opinions than some people. The politician was elected by the people. Maybe the head Rabbis of KJ and Williamsburg should be elected by the people for a 4 year term. "Next time when Muslims kill us.." I hope it wont happen. Ever. Unlike your White Christian MAGA Bomber with Trump pictures and the White Christian Pittsburgh Mass murderer of Yiden. And the History of white Christians killing us for 2000 years. Ok Lets talk "DAAS TAYREH" What is your opinion of the DAAS TAYREH the heiligeh Satmarere Rebbe (The Leader of most Chassidim in the World today) against this Skoufis? Or even more Interesting What is your Opinion on this " DAAS Tayreh " of Satmar AntiZionism. a) Every Yid is obligated to follow Daas Tayreh and go Demonstrate against Israel Publicly. c) There is no such a thing in Halacha as Daas Tayreh and you and some similar minded invented it to use it against everyone you disagree. (I just asked my brother in law who finished Shas 24 times and said he never heard this word untill about 15 years ago. It was invented by some Lutvaks against Chabad. Some of these comments are so off base. The fact is the directives of the education department will affect non jewish private schools as well as schools like Ramaz, Mir, Satmar and everything in between. In addition some commenters write as if Satmar is some small fly by night cult. You may not agree with them on Israel but between all the Satmar yeshivas in in New york you have about 10000 students ken yirbu. Then you have Bobov, skver, vitznitz, and many others. Of course we have to our hishtadlus and get good lawyers to fight for us but this guy is just a Yivani in different clothes We beat the Yivanim the first time and we will beat them again. as long as Satmar keeps voting for leftists who support toevah this attack on Yeshivas will get much worse RL. “ "Next time when Muslims kill us.." I hope it wont happen. Ever. Unlike your White Christian MAGA Bomber with Trump pictures and the White Christian Pittsburgh Mass murderer of Yiden. And the History of white Christians killing us for 2000 years. Ok Lets talk "DAAS TAYREH" What is your opinion of the DAAS TAYREH the heiligeh Satmarere Rebbe (The Leader of most Chassidim in the World today) against this Skoufis? Or even more Interesting What is your Opinion on this " DAAS Tayreh " of Satmar AntiZionism. 3) Even the heilga stamar reba ZY"A held that when it comes to goyim we support israel since yidden live there and goyim don;t distinguish. Perhaps we need to denounce the medina but we still support goyim that support israel like Trump. Nice speech, but you are not explaining #14's point. In Brooklyn (and many other places) tens of thousand of Jews live next door to 10's of thousands of Muslims. No problem at all. No suicide bombing, stabbing etc. ever. (2-3 in 50 years is less than avg. so please don't tell us about a single isolated incident) When they move away from their Muslim (and Spanish) neighbors to the White Christian American towns like Monroe, Rockland,Toms River etc. there are immediate repercussions, hatred etc. No one ever complained in Brooklyn about the ERUV (Except some Lutvaks) In Toms River etc they dont care about the Eruv, they dont want you next to them. TERRITORY. LAND. Why is this so hard to understand? "Satmar keeps voting for leftists" Really? And here I was told by a VERRRRY EDUCATED that Frum Jews all voted for Trump. FYI Satmar alone is now more than 35% of frumm Jews. Modern Orthodox in Teanack, 5 Town etc is maybe a little more than it was 70 years ago. Satmar went from 200 (The first satmar Yeshivah) to more than 60.000 today. Keyn Yirbu. Its not rocket science do the math. Avg Family kayne hare 10 children or 10.000 within for Generation.
" Satmar keeps voting for leftists" You starting to get it. 87 % of Yiden vote democrat. Modern Orthodox are the only republican voting Jews left. They have keyne hore 10 -14 kids per familiy, Modern Orthodox have avg 3-4. Do you understand the difference in 4-5 Generation. Please take a pencil and paper and start righting or just look around in the last 70 years. In Israel when they nfirst granted the military exemptions the Charedim were 3% today they are 24% keyn yirbu (mostly chassidim) In america is even bigger, much bigger since the reform slowly disappearing. In a not so distant future 95% -98% of Yiden will vote Democrat. There is a reason they all live in NY, LA etc. A Family of 12-16 even with a PHD or make it 2 PHD's cant survive without Public Assistance what only the Democrats will provide. A Yid is a yid. Yiden are democrats. The is no Jewish Republican in Congress. "Satmar keeps voting for leftists" to get welfare,Medicaid etc.just like other americans. Its so much bettter than the Flatbush/5Town people who vote republican send their messed up kids to Israel to collect FREE Medical Insurance and Child Support from the Israeli Hard working Army going Public. They never worked a day in their life. Go to Israel for a Yeshivah and stay there for many years without working or going to the army. "The heilga satmer reba Zy"A held that when it comes to goyim we """"support Israel"""" FAAAAAAAKE News. No way did the Satmerer (Or The Lubavitcher) EVER EVER EVER said ""support ISRAEL""" DID NOT HAPPEN. Maybe in your Dream. Ask any Satmerer or REAL Lubavitcher. For your own good refrain from posting anything related to Torah and Yiddishkeit. ‘Daas Torah’ is indeed a litvishe invention. 9/11 was the Saudis. Your POTUS Friends. A yid recently was hit by a car from a Muslim? Really. One Muslim out of 3 million in the USA. You are talking exactly like Rev Sharpton. "A black innocent boy was killed by a Jewish driver, lets riot" Crown Heights? Remember? Silly argument. You think if they moved to newark or Camden it would be better. Its the differnece between a city vs a suburb. I don't know of too many balck suburbs. In reality it has nothing to do with anti semtism. The reality is when jews move to suburbs they bring the urban life to them (nose , lots of cars , houses) People in suburbs resist that. it happens to be that they are white. But bodem really has nothing to do with klutz. Nothing to do with being white. That's not why they have tzarus. 2-3 maybe very little but look at the severity too not just frequency. The severity of 9/11 was so bad. Sir look at the polls. Trump got 80% in, BP Lakewood Monsey midwood 5 towns, crown hieghts . Even in williamsburg he won 50%. I know noone counts besides for your reba in KJ and we are all out of twon and a minorty. Its nonsense and pure lies to say Satmar is 35%. Fake fake news. You are cooking fake numbers. 4. whoever votes for a pro teovah candidate might be "frum" but he is NOT shomer torah umitzvos. In Lakewood When Corey Booker ran for Senate the best ED in Lakewood voted like 400 something - 2 against him. I doubt you would find any court (conservative or liberal judge notwithstanding) that would agree with your analysis and allow religious arguments to enable religious students to meet minimum education standards. Perhaps subjects referencing the age of the universe/earth might be found to be an unnecessary burden on religious practice, but good luck making such arguments for subjects like math, english, history, other sciences, and current events. These are all essential subjects that the State has a vested interest in its population learning. Telling a court, that your students intend to learn in Yeshiva and scrounge a living off whatever work their wife does and government programs, legal as it may be, is not going to be very convincing. Kiryas Joel has the highest poverty rate in the nation, which strongly indicates that they need to get their education and job situation fixed. If R' Joel's vision was to have a poor community living off government funded social programs then I guess his vision was a success. "Rav Kooks words are Divrei Elokim Chaim." Mishpat Kohen 58-63, 69 discussion on heter mechirah Rav Kook rules that the Arabs of the Holy Land are Gerei Toshav (AZ 64b) whose rights are protected no differently than of Jews. “Even hisachdus” - they are consistent, and for that same reason they hold that it is forbidden according to the Torah to participate in the Israeli goverment. The Yeshiva word, along with everybody else left of the satmar viewpoint, should have no problem voting for leftists if it suits their agenda, very much the same way they have no issue voting for and participating in the Israeli goverment. There are numerous kol korais from the Yeshiva world also banning voting for candidates, including R Belsky, R Shmuel Kamintzky, R Yisroel Neuman, R Nelkenbaum. PS There are also Modern Orthodox Rabbis who signed such kol koreis. The bigger chidush is Satmar. “ There are numerous kol korais from the Yeshiva world also banning voting for candidates, including R Belsky, R Shmuel Kamintzky, R Yisroel Neuman, R Nelkenbaum. As noted, there is no chidish in satmar - they are consistent in their opposition to candidates and goverments based on their world view. The Yeshiva world, and if you’re right about the MO community, are hypocritical here. If you can participate in the Israeli goverment and vote for their candidates, they should have no issue voting for candidates who aren’t completely in line with their world view and values.